This is essentially, an edited out section of the last episode on the Six Grandfathers and American history. Current research shows that on the day of birth a baby boy will look at a mobile hanging above his bead. A baby girl will look at a face. The one is a techomatrix orientation and inate fascination with technicality (head), the other empathy (heart). Head and heart are biological divisions and they are binary yang and yin orientations in the world. All societies divide between head and heart. Paris (above, Ile de la Cite and Left and Right Banks with Notre Dame's Rose Glass superimposed on the Ile de la Cite) gives a perfect example: the bankers and burgers live on the Right Bank of the river Seine (in red) and the artists, writers, hippies and mystics live on the Left Bank (in blue). 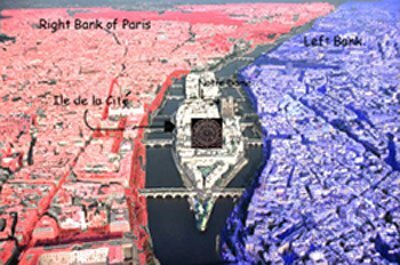 The two halves are divided by a river connected by the Pont Neuf and held together by a perfect jewel: The Notre Dame Cathedral with its rose glass on the Ile de la Cite. Europe likewise divided between Roman (head) and Greek (heart) in Imperial, Christian and Cold War spheres, but unfortunately has no Ile de la Cite to unify and absorb its opposites today in a mandala. A distinct binary relationship can be seen extending across Asia as well from India to Japan. 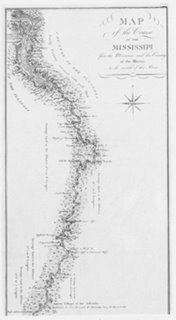 Vedic (yin) Asia has its source in India but extends to areas that were once Vedic and are now Buddhist, like Thailand and its neighbors. The Vedic influence is palatable in Thailand and Laos. With Taoist (yang) Asia, China, Korea and Japan (Japanese zen owes itself to Taoism and is an extension to Taoism: See Suzuki’s Introduction to Zen), a binary relationship can be seen. The Vedic/yin regions feature yoga and graceful dancing, while the Taoist/yang regions express themselves in cerebral discussions (or non-discussion discussions as in Japanese Zen) marshal arts, stick fighting and in the farthest corner, Samurai swordsmanship, none of which are prominent in the Vedic areas. Tibet has influences of both; archetypal deities that resemble the Hindu pantheon, and the Taoism’s tai chi (yin/yang symbol) sits in the center of the Tibetan flag. Tibet, which calls the center of consciousness the Jewel Heart is in itself the Jewel Heart of the extended mandala of the East. The destruction of Tibet as a sacred center and its occupation by communist China will likely upset and destroy the ancient, balanced symmetries between China and India and those within the entire Asian continent. The Asian regions developed these relationships over thousands of years, but the entire region will lose its internal yin/yang features as East and West adjoin in our times and a new global relationship develops a new Jewel Heart between East and West, founding a new benign mandala vortex around the Chicago/Toronto area thereabouts. This is a new world picture which has been moving to this one point since the beginning of civilization. It is the Aquarian mandala. There is a well-known analysis in psychiatric lore about "Henry’s dreams" (picture here from Man and His Symbols, edited by C.G. Jung), which refers to a long series of archetypal dreams that brought a psychiatric patient of C.G. Jung associate Jolande Jacobi to face deep and irrational powers within himself. 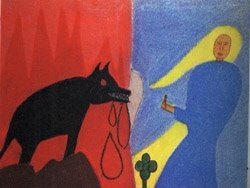 During analysis, Henry drew a picture with a blue field on the right with a Madonna-like woman standing in it and a red field on the left with a wolf-like black monster in it. The picture suggests that the forces within Henry are dangerously incompatible, but in the center of the picture is a mandala-like flower which links the opposite sides. This personal dream of Henry's classically illustrates the situation described in the illustration above on the banks of the Seine in Paris, the left bank (artists and writers), the yin side, and the right side (bankers and business people), the yang side, united by the cathedral on the Ile de Cite. Further investigation reveals that this is the same pattern on the flag of France; a left field blue and a right field red, connected by a white field, meant to suggest the lilies of the field. draft - The Thee Celestial Ones - intro.